We knew it was coming but that hasn't made this reveal any less sweet - Porsche is sending the 991 generation 911 off in style by bringing back the legendary Speedster name. As expected when Porsche first showed off the concept car, the 2019 911 Speedster will essentially be a roofless version of the flawless GT3. This means a 4.0-liter flat-six engine capable of revving up to 9,000 rpm and producing 502 horsepower and 346 lb-ft of torque. The epic flat-six soundtrack will be even sweeter than it is in the GT3 because the Speedster's roof comes off. Porsche hasn't just ripped the engine out of a GT3 without making any changes, it has also added individual throttle bodies to make throttle response even sharper. 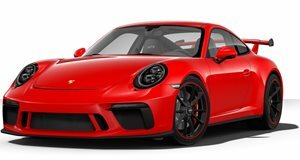 We didn't know whether or not Porsche would offer a choice of transmissions but like the GT3 Touring, the Speedster will only be available with a six-speed manual transmission. While a PDK would be faster, the manual is still pretty quick. Porsche says the Speedster can hit 60 mph in just 3.8 seconds and reach a top speed of 192 mph. In traditional Speedster fashion, this new model features unique design elements such as a low-cut front windshield and side windows and a manually-operated fabric top. Porsche has stripped out the interior with lightweight door panels with storage nets and door pulls. The Speedster also has red interior accents and 'Speedster' logo stitched into the seats. Keeping the car as light as possible was Porsche's main focus so the air conditioning has even been omitted, though customers can opt to have it back. The standard Porsche Ceramic Composite Brakes only weigh around 50% as much as the standard iron rotors, while the six-speed manual weighs around nine pounds less than the seven-speed found in lesser Carrera models, and almost 40 pounds less than a PDK. In total, the Speedster weighs just 3,230 pounds. In addition to all of the weight savings, the Speedster features a lot of GT3-derived components such as a specifically-calibrated rear axle steering system and dynamic engine mounts. Porsche will only build 1,948 units with order books opening on May 7, 2019. The car is expected to reach US dealers in late 2019. All Speedster buyers will also have the chance to buy an exclusive 911 Speedster Chronograph timepiece with a carbon fiber dial, and a rotor styled to look like the Speedster's center lock wheels.